Happy Wednesday! How are you doing? Things are good here. I wanted to say thanks to everyone who commented on my latest ripple blanket. I appreciate your kind words! I know it's nothing all that special but I had fun making it. I'm also excited to have used up a lot of my stash; I gave it all a close look the other day and I really don't think there's enough worsted-weight acrylic to make another blanket. I can switch to smaller projects with it now if I want to. The next step will be chiseling away at the DK acrylic stash, which is a bit daunting if I'm honest. There's a LOT of that to use up. This time of year always feels really productive to me, and I'm enjoying myself at home, doing little things here and there. One thing I've wanted to try for a little bit is a scarf pattern I found on Ravelry, the Spring Petals Scarf by a Ravelry member called Ragamuffin. It's a simple pattern and I figured it out fairly quickly. I decided to use another stash yarn for it, Caron Simply Soft in Pistachio. I love Simply Soft for scarves because it drapes nicely and feels soft and silky on your neck. I'm thinking about giving this scarf as a gift, but if I decide to keep it, I know I'll enjoy wearing it myself. I started a new cross-stitch project too. I just finished a small one that is part of a set of two that I've been working on for what seems like years; my cross-stitch game was off for a little while (I'll share those two soon, I hope). But I feel inspired again so I started something new. This one is Polish Floral Heart, from an Etsy shop called Galaborn Patterns (click on the link to see the design in color; I only have a black-and-white printer and I can't show you the pattern in all its glory!). I love this design and have had it in my collection for a couple of years. I'm finally ready to work on it and it's a pleasure so far. I'm using stash embroidery floss for this design and it was fun to go "shopping" in my floss storage for colors, which are not quite the same as the pattern specifies, but close enough. I've been catching up with my magazines lately, having let the pile grow during the holidays. But I made it through the January issues and am currently working on February. I love February issues of magazines; the colors are always pretty and the projects are sweet and lovely. And I finally got my turn with a library copy of Tana French's new novel, The Witch Elm. I'm a longtime fan of her books, though I have not loved them all equally. I find her books to be a bit hit-or-miss, but all of them have been readable. This one is not related to the others, which featured the Dublin Murder Squad and its cast of crime-investigating characters, which made it more appealing to me (I'm a little tired of them, honestly). I'm only a few pages in and it's good so far, but I'm reserving judgment for now. It's just good to have books around and the time to read them. I've been adding new books to my library holds list lately, just trying to catch up with the latest hits. I probably won't see most of them until summer, but that's just fine since I will have more time to read then. After watching my little philodendron languish in the corner of the kitchen for the past year, I decided to take it out of its pretty macrame hanger and put it on the built-in shelves in our family room. This window gets the most light of any window at the back of the house and I'm hoping it will be enough for this poor plant. To be fair, it has grown, but I don't think it's going to do much more than this if it doesn't get more light. Our house just isn't great for plants, I've concluded. The front of the house faces south and the sun streams in nicely but there are only two windows on that side of the house, with only one of them appropriate for plants, but every plant I've tried there gets burned up by the intense sun in the window. The back of the house is much darker, with mostly north-facing windows, including in my bedroom, and plants can't get enough light. This window faces east, so I'm hopeful that I can make it work here. This may be a sunny climate, but I just can't get the indoor sun right for good plant life! Frustrating. I've been baking a quick bread recipe for a few months and trying different things with it, to mostly great results. The recipe is called Healthy Banana Bread and it comes from a food blog that I love, called Cookie and Kate. It's a great, easy recipe that results in delicious, moist bread that is actually decently healthy, so it's a win for me. I've been experimenting with the recipe, substituting different fruit or veggie puree for the banana. So far, I've tried pumpkin bread (subbing one cup of canned pureed pumpkin for the banana) and applesauce bread (subbing one cup of unsweetened applesauce for the banana). Yesterday, I did the applesauce version with the addition of about 3/4 cup total of golden raisins and chopped walnuts. It's delicious! I think I'll cut the applesauce down slightly next time, since the bread is just slightly "puddingy" in the center; the raisins probably added a little moisture. I might also increase the baking time. It came out well overall, though, and I enjoyed a slice with my evening tea last night while waiting on the dryer and watching Forensic Files (yes, I'm still on that; there are hundreds of episodes to get through, and frankly, it's the perfect show for laundry night). I hope you're having a good week! Life is busy but good here. I'm looking forward to our weekly episode of Midsomer Murders tonight, Private Friday is this week, and Super Bowl Sunday! Plus I have library books, crochet and cross-stitch, so I'm all set. Enjoy the rest of your week. Hello! I hope you've been having a good week. Here, the floor project is almost wrapped up, to my relief. The furniture is back in the room but it's every which way while we wait for the flooring man to come back one last time (he was here yesterday), to finish one little area of edging that was measured incorrectly and therefore just a little too short. I'm just a tiny bit annoyed, but I'm staying calm. It will be okay. Meanwhile, life goes on as normal and we've had a productive week. A big school project (almost all video, which is pretty cool) is finished, some serious cleaning has been undertaken, and the yard is looking good after a little tidying job. I like January - it agrees with me. The cold is welcome, the days are a really good length, and I feel motivated and energetic. 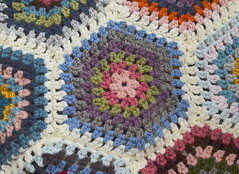 Today, I want to share my latest crocheted blanket creation. I know, I'm still making blankets over here. It's just about seven years since I started making my first ripple blanket, using Lucy's Neat Ripple pattern, which we used constantly until it literally fell apart, stripe by stripe, over the past year or so. I guess you could say we used it to death. It went out the door in a trash bag just a few months ago, having reached an irretrievable state of disrepair. I decided to crochet a new ripple to replace it, because I really like having a big ripple blanket around. The fabric made from this pattern is warm and substantial, a great weight for cold-weather enjoyment. This new blanket, like my last few, was a stash-buster. I had a lot of worsted-weight acrylic yarn to get through, just to use it up and make room for something new eventually (not even sure what yet, I just wanted to get.this.yarn.out.of.here.already). Notably, this blanket is the first one I've made without a single purchase of new yarn. I have often bought a ball or three to fill in gaps in my color collection, but I didn't do that here. I was deadly serious about finishing up. And here we are. The blanket is quite large, so it wasn't easy to photograph in its entirety, but I think you can get the idea from this photo. I think it's about six feet long by five feet wide, plenty large enough for using while we read or watch TV. The Bear seems to think I made it just for him, and I haven't disabused him of the notion. He certainly deserves a good blanket. The colors are kind of a hodge-podge, but that's a stash-buster for you. I think they're mostly in the same family and work well enough together. I've come and gone with brightly-colored blankets over the past few years, and there are more deliberately-planned blankets in my future, but I'm glad to make something a bit motley too. I tried something new with my color arrangement this time, inspired by this Neat Ripple project I came across on Ravelry. The maker of that blanket says in her project notes that she planned her colors by picking a color that looked good next to the previous one. Simple, right? I have always tried to plan stripes several at a time, which works okay for the most part but also tends to drive me a little nuts as I try to remember what I was going to put where. So I decided to try this approach instead, and you know what? It was so refreshing, a real pleasure. I didn't worry about whether a color would work with another one two or three rows back (or, you know, ten rows back in my most obsessive moments). I just went with the one I'd just completed. This was so much easier and I didn't agonize over colors much at all. It made crocheting this blanket a lot more fun. 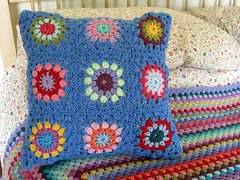 If you've never crocheted a blanket from this lovely pattern, I think you should. It's a delight to work, just going up and down, valley to crest, side to side. I like it very much. It's easy to memorize, and you can do other things while you work, like watch TV, help kids with their schoolwork, listen to podcasts and talk radio or your favorite music. Really, as long as you can count to four, you're good. I didn't add a border to this blanket, which is unusual for me. But to be honest, I don't actually like borders on ripple blankets. I think they look a little strange, and don't really enhance the beauty of the ripples themselves. I also felt that with so many colors, it might look a little too busy. The sides of a ripple are naturally neat and straight, and the ends have a pretty, scalloped shape. I just left it alone and I'm happy with that. This new blanket has already gotten lots of use and that makes me very happy too. Our cold winter this year sends everyone scrambling for a blanket to use whenever they're on the couch. We're spending more time in the house and that means more snuggle time under a blanket, which is never a bad thing in my book. Yes, another ripple was just the thing for me and the rest of the family. I was sad to see the demise of my first big blanket project - the ripple I labored over for weeks just to get the stitch pattern down, and then another few months to get it big enough to actually wear it - but making a new one gives me a great feeling of accomplishment and progress. 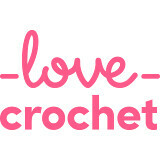 I've come a long way as a crocheter and I've learned a lot about myself along the way. It's amazing how much crafting can change you, giving you skills and confidence in yourself, a belief that you can learn new things and make something everyone can enjoy. I didn't have those feelings very often before I learned to crochet but they're solid in me now. My new ripple reminds me of the important journey I've made - the things I've learned, the rewarding experiences I've had as a crafter and a blogger, and best of all, the wonderful friendships I've made along the way. Crochet has been a powerful force in my life, unexpectedly and blessedly. Yarn: I Love This Yarn worsted acrylic in the following colors: Cranberry, Terra Cotta, Old Rose^, Rosy Cheeks, Sea Blue, Glacier, Arctic, Antique Teal, Stonewash, Navy, Graybeard, Graphite, Coffee, Sungold, Dark Olive, Mid Green, Ivory, Black (^discontinued); Vanna's Choice worsted acrylic in following colors: Rose, Dusty Blue, Dusty Purple, Dusty Green; Yarn Bee Soft & Sleek aran acrylic in Mauve and Plum. Hello from the land of unexpected wintry weather! We've been having a real winter this year, the first one in several years, I think. It's been almost back-to-back snow or rain or mixed precipitation storms since the end of December and I have to say that we've all been loving it! Those are my feet up there, in the Bear's snow boots. I don't own a pair myself - it's never wintry enough to justify the purchase in my book - but we do have his, so if we need to go out in the snow to collect eggs, say, we wear his. We are getting eggs again, by the way. I thought we'd have to wait until spring, but we're getting one egg a day already. Nobody knows what's going on around here. We had a wonderful Christmas! So relaxing, especially with a few different storms mixed in. We hardly left the house, aside from trips out for groceries, the occasional walk, and an afternoon spent at the movie theater on the military base where the Bear works, for a showing of Home Alone on the big screen. I was really glad the kids had a chance to watch it that way; my first viewing of it was in the theater as a special treat for my twelfth birthday a week after it was first released. It's been one of my favorite movies ever since, Christmas-themed or otherwise. Our holiday was lovely and we had a very nice time just sitting around, trying out our new things and enjoying the break from school and work. One of our "family gifts" was an XBox One, which has been great. We're using it for games as well as for streaming programs. Netflix and Amazon Prime look completely different on the XBox. It's a lot like when we upgraded from using our Nintendo Wii to a BluRay player for streaming. I guess that's what happens when you jump 5-10 years in technology with every move. Go figure. Life since Christmas has been busy in a somewhat annoying way. There have been multiple home issues to deal with; nothing major, just smallish, irritating things that we needed to address, like a damaged window frame, a minor roof leak, a broken sprinkler head, clogged canales, and other assorted small-but-niggling concerns. Today, we're having a much more major project completed, though we're having it done professionally. I have given up on the carpeting in our family room and we are having hard flooring installed. It's what they're calling "luxury vinyl plank flooring" these days; it's like a wood-laminate floor but it's made with vinyl in the top layer to be waterproof. Since the family room borders on the kitchen, with the dishwasher built into the peninsula that separates the family room and kitchen and where water has leaked previously, we decided that waterproof flooring was a must. We had never even heard of this type of flooring (the vinyl I knew was limited to peel-and-stick tiles), but apparently there have been innovations. I already have a new room-size Oriental-style area rug to put down (it will only cover a portion of the room, just for warmth and the look of it). I'm excited to be getting a new floor, but it's that mix of annoyed and excited because the carpet was only five years old but it wore horribly and the room looked awful. By the way, does anyone remember when we got this carpet? I blogged about it in 2013! You can see my then-tiny children and also the basic look of the room before today. We had hardly changed a thing since the last time we fixed it up. I think mainly the GB's toys in the corner are different now. I sure hope this flooring lasts better than the carpet did. I do not want to do this every five years. I've been enjoying my regular pursuits in the meantime. Highlights include baking focaccia to have with slow-cooker minestrone soup (the focaccia recipe is from my Betty Crocker cookbook and also found here, and the minestrone is my own recipe, found here). Yesterday, we made potato knishes from this recipe and they were fantastic - almost as good as the ones I remember from my New York upbringing. I will definitely make them again. I've been enjoying new recipes and healthier ways of doing things. I don't like to announce things like this because I am a strong if misguided believer in jinxing, but I have lost 30 pounds over the past year, largely because of a change in how we cook and eat, and feel really good. Otherwise, I've been reading a lot and also finished a cross-stitch piece and another crocheted blanket, the ripple I started in September to finish up some more yarn. I even did some machine-sewing, finishing a project that sat waiting for my attention for over a year. I've been watching Forensic Files, mainly, and of course, watched Victoria last night when it came back for a new season. But honestly, I enjoyed Lucy Worsley's show afterward on Victoria and Albert's wedding so much more. It was fascinating! I love her shows so much. I try to watch them whenever I see a new one. Thanks to those who reached out wondering why I haven't blogged lately. I've just been busy with other stuff and not really feeling in the blog groove, you know what I mean? I miss it, though, and will be trying to get back to it now. I guess it just got away from me these past few weeks. I hope you're doing well and having a good return to normal programming after the holidays. This is one of the best times of year for me, and having it feel more wintry is only a bonus, so I'm very happy about January. No blahs here at all. ***Links in this post that are meant to go to other posts on my blog seem not to be working right now; they all go to this post. Sorry about that. I hope it's just a Blogger glitch!